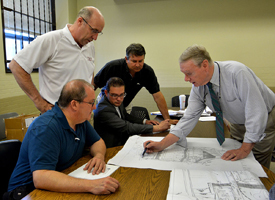 Construction of the new Market Basket at the General Electric Factory of the Future site is set to commence this week. On Tuesday, the Site Plan Review Committee unanimously approved the project, clearing the way for building permits to be issued. The foundation for the 84,000-square-foot store will be poured this week on the $25 million project. “It’s a very exciting thing for the city and its residents who are getting a raise in pay by cutting their grocery bills and getting high quality products,” said James Moore, the attorney representing Charles Patsios, the site’s owner and Swampscott developer. Market Basket, which will join Shaws, Stop & Shop and PriceRite in the city, is scheduled to open next summer at Federal Street and Western Avenue. The Site Planning Review Committee meets regarding the Market Basket site on Federal Street at Lynn City Hall. James Moore of Bradley Moore Primason Cuffe & Weber LLP, describes the site plan to Robert Stilian, James Cowdell, Clint Muche and Jamie Marsh. “This is the culmination of a few years of effort so we’re very excited,” said James Cowdell, executive director of the city’s Economic Development and Industrial Corp. He praised Jamie Marsh, the Department of Community Development director, for securing $2.5 million in MassWorks money for infrastructure improvements around the supermarket. “It’s interesting when you think of the scope of this project how the neighborhood almost universally supported it,” Cowdell said. The store will employ 75 full-time employees and 325 part timers, he added. Shuttered since 1988, the once state-of-the-art factory sat empty until Mayor Judith Flanagan Kennedy met with high-level GE executives to discuss steering the site toward redevelopment. Patsios bought the 16-acre property from GE in 2013 for $4 million. Market Basket CEO Arthur T. DeMoulas joined city and state officials last year to announce $2.5 million in state money for road improvements around the site.